Nirenstein is an “Italian” MEP? Nope, because Italians are White Europeans. She’s a Jew. Not the same thing! (In fact, she even admitted that she’s a Jew first and foremost) . She holds dual citizenship, living in Israel, too, which is an apartheid state. She’s acting racially by being a Zionist Jew, while at the same time trying to deny Whites their right to preserve their culture and heritage. Good for the Hugrarians. They rejected her suggestion. They should have walked up to her like that Golden Dawn dude in Greece and slapped her across the face. Hey, bjt, here’s a “German” politician named Zeca Schall. Italians have dark skin, curly hair, big dark eyes, you say? Well, so does this German! So much for your hare-brained theory on White Europeans. You have to look at the individual, nit-wit, NOT the nationality. Hey, what happened to blt’s comment? Another Jew assaults the world. Nothing new. Israel is the pseudo Jew capital. The true stronghold for the international Jew is America. I could tell she wasn’t ethnically Italian ,just by looking at her ugly Khazar-camel looking puss. Plus, also being half-wop helps too!!! Greetings to all of you, my fellow Whites!!!!! Nice to read the great Mr. Cardillo’s comments again! 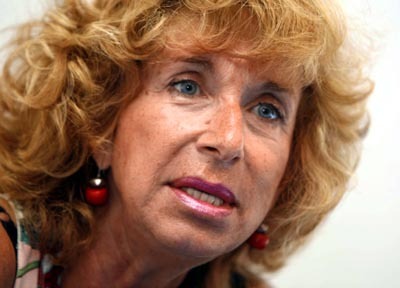 That JEWESS looks like an alien space reptile wearing a crude humanoid costume and Harpo Marx wig. But then again Jews ARE alien non-humans. She looks like the comedian David Brenner in drag. At a matter of fact I think it is David Brenner in drag! Jews are physically inferior which explains why the Jewess is uglier than a can of worms. I CAN’T STOP LAUGHING! You’ve done poetic justice to alien growth hormones. But what happened to blt’s comment? I know that I saw it. Thanks, Miss Emily. I sho’ likes to ennertain dem white folks! God, do I love this site!! !The information and the humour from all of you is truly a blessing!!!! Thank you again Tim ,for your kind comment ,Mate!!!! She’s as Italian as Olive Garden. I love Italian women, I’m married to one, and I can tell you that jewess is no Italian. Real Italians should throw that jew witch into a fire pit and burn the ugly off of her.